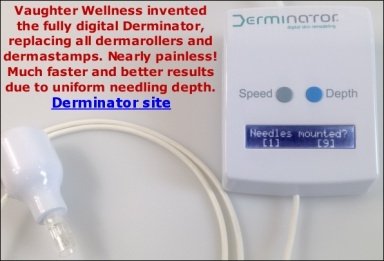 Hey Sarah, do you reccommend dermastamping scars before getting filler treatments for scars? This way the filler can help lift the scar that isn't being held down ? I do recommend dermastamping before getting filler treatment but not very shortly prior to the treatment because stamping will renew deep layers of skin and this renewal could speed up the elimination of the filler. Wait at least one week. It is basically fillers using Kinetic energy instead of needles but I will wait three weeks between stamping and the treatment. My question is, should we count 6 weeks (Im using the 2mm dermastamp) from the last session of stamping, or from the last day of suctioning? Since the brusing and light bleeding is recurrent with the suctioning? Thanks! Thank you, Sarah, for your efforts and investment in developing the perfect single needle. I'm looking forward to purchasing one as soon as they're available.